Art Basel Hong Kong began 2013 with a focus on Asian and Asian Pacific galleries. Now being on its 5th year, the fair is set to see well over 80,000 visitors for this edition. The increased cultural interest and exposure has brought hundreds of galleries together to exhibit contemporary art. Pelham have picked out highlights from the fair, as well as satellite events to visit during Hong Kong Art Week. To coincide with Art Basel Hong Kong 2018, K11 Art Foundation (KAF) presents Emerald City, a group exhibition which will bring to life a cross-section of artistic approaches to rethink geometry in relation to the connectivity of universal knowledge through space. The exhibition, showing approximately 40 artworks across multiple disciplines including painting, sculpture, video, photography, site-specific installation, in Cosco Tower and chi art space in Hong Kong, will provide an exploration into how geometry, the measurement of the Earth (geo), influences our imagination of the world. Joël Andrianomearisoa, When the day belongs to the night I, II and III (2016). Cosmin Costinas exhibition, Dhaka Art Summit 2018. 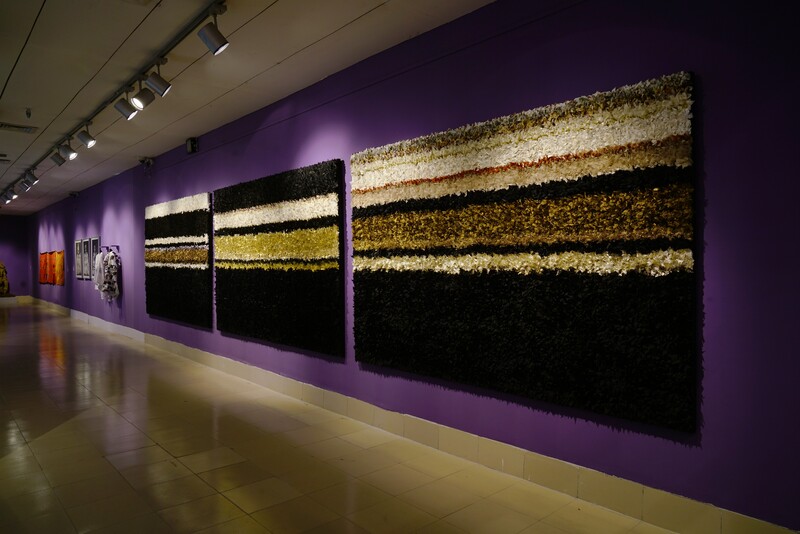 Courtesy of the artist and Sabrina Amrani Gallery, Madrid. Beast, a God, and a Line first debuted at the 2018 Dhaka Art Summit in Bangladesh. This exhibition is woven by connections and circulations of ideas across a geography with Bengal at its core. This geography – arbitrary as any mapping, not least in contemporary art exhibitions - is commonly called the Asia-Pacific, but it could also be defined by several other definitions, which the exhibition explores and untangles. The exhibition continues to 20 May, 2018. South Korean gallery, Gallery Hyundai will be presenting a booth at Art Central. Works show include that of Michael Craig Martin, who has two shows with the gallery. In the late 1970s, Martin began to make line drawings of ordinary everyday objects characterised by their boldly outlined motifs and vivid colours. Korean artist, Yoo Geun Taek, also has work being shown. Geun-Taek has been showcasing the potential of modern Korean painting and became a key figure of new wave within the Korean art scene. To familiarise traditional, ideational Korean painting, Yoo focused on the concept of ‘everyday life’. Other artists being shown are Suh Se Ok, Shin Sung Hy, Seung Taek Lee, Minjung Kim, Chung Sang Hwa. Mark Bradford is an American artist who lives and works in Los Angeles. Bradford’s work investigates the way in which ostricised populations are managed within society. The exhibition shows the artist’s new large-scale paintings where the ‘map’ has been used as motif for inspiration. Using archival versions of maps that manage or control society, such as transit maps, advertising and outdated maps used on bond securities. Following the incredibly popular Tate Britain exhibition, All Too Human, Marlborough Fine Art will be showing previously unseen works by Frank Auerbach. Auerbach's organic yet unified forms are deeply rooted in realism and are often renditions of people he knows well. His oils, drawings, and prints reveal an intense observation of the subject; he makes his mark with authority and finality, and arrives at the essence of his figures. Auerbach’s signature thick black lines and the furious mark-making he employs give his sitters a flickering quality of energy. Three simultaneous projects of work by the formative “pop-surrealist”, Mark Ryden are being presented in Hong Kong. Following its enormous success in the United States, Whipped Cream, a collaboration between Ryden and the American Ballet Theatre that balances high art, fantasy and ballet, will premiere at the Hong Kong Cultural Centre during the Hong Kong Arts Festival 2018. Alongside the performances, Mark Ryden has created Quintessence 132 – Mezzo Dodecahedron, a sculpture that carries the central eye motif from the Whipped Cream stage into the public realm. At this exciting moment of celebration of the diversity of Ryden’s practice, Paul Kasmin Gallery will present a solo exhibition of approximately 16 works by the artist in the Kabinett section of Art Basel Hong Kong, 2018. Glasgow based gallery, The Modern Institute, are showing works by Swiss-born artist Nicolas Party. The artist is known for his bright and colour-saturated paintings which often depict portraits and still lifes of objects from the everyday. The objects are reduced of any superfluous detail so as to explore into the art of painting as an art in and of itself.